Is your kid denying or bored of Multigrain porridges/Health drink? I myself have denied it when I was a kid.Mom tries to make me eat by making ladoo or dosa or roti/chappathi. 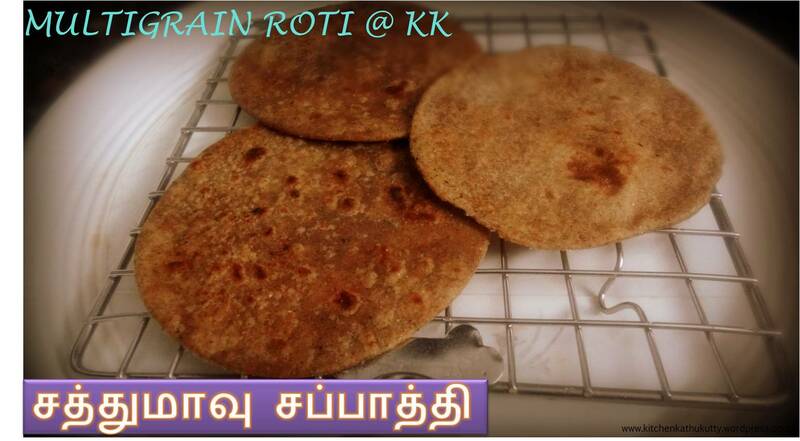 Here I am with Roti from multi grain porridge mix or sathu maavu or health drink mix. 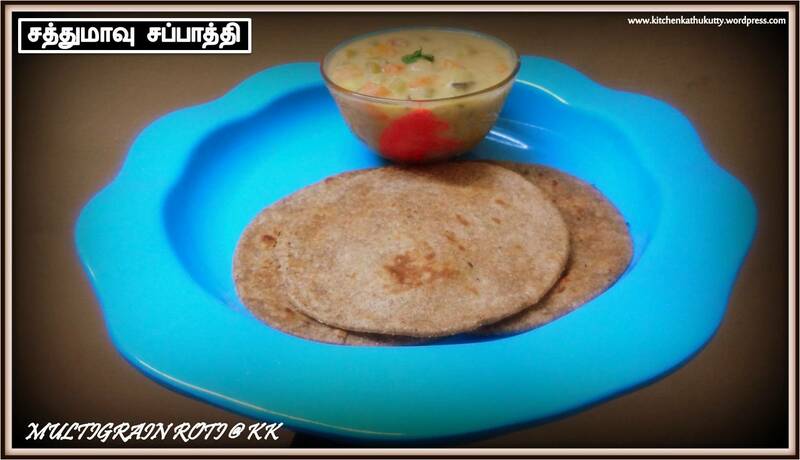 Why don’t you try this roti/chappathi for tonight? I had stocked up more of sathu maavu at home and was out for more than a month.I first thought it would be tough kneading the dough into roti and I was sure that it wouldn’t be easy to directly heat on fire like phulkhas. But to my surprise it came out so well. It can be either made on tava directly or even on fire. Refer the recipe of the health drink mix(home made) here. This can be your baby’s dinner or breakfast and even a lunch box recipe. 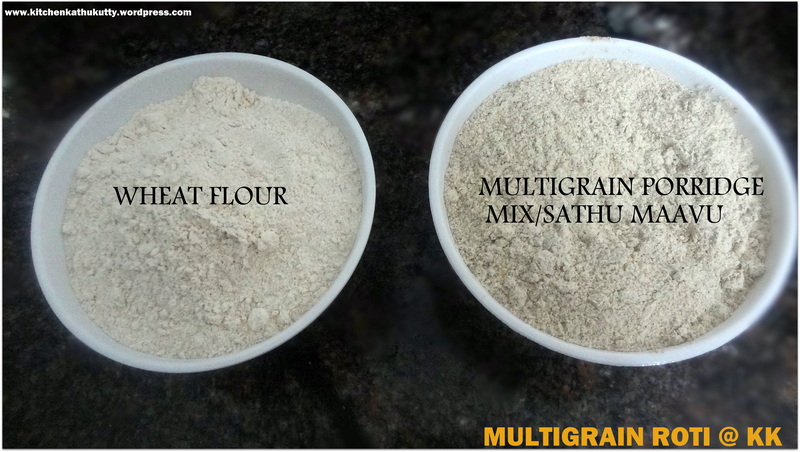 2.Mix porridge mix & wheat flour evenly and knead it into a smooth roti dough by adding water and ghee. 3.Set it aside for half an hour by closing it with a damp cloth/plate. 4.Make balls out of the dough and smoothly roll into rotis by dusting with wheat flour. 5.Cook it on tava or on direct flame. I used samba wheat flour. You can use home made wheat flour. Adding 2 spoons of lukewarm milk instead of ghee also helps in achieving a smooth dough. I rolled it slightly thicker than I usually do. It has to be served hot. Or else it tends to become hard. To pack for lunch boxes , amke it thinner and prepare like phulkha. If you have not introduced sathu maavu/multigrain porridges earlier don’t use for first attempt. Be sure to have introduced all the grains in the mix prior in hand separately and ensure no allergies. Always have a word with your doctor before introducing any new food.